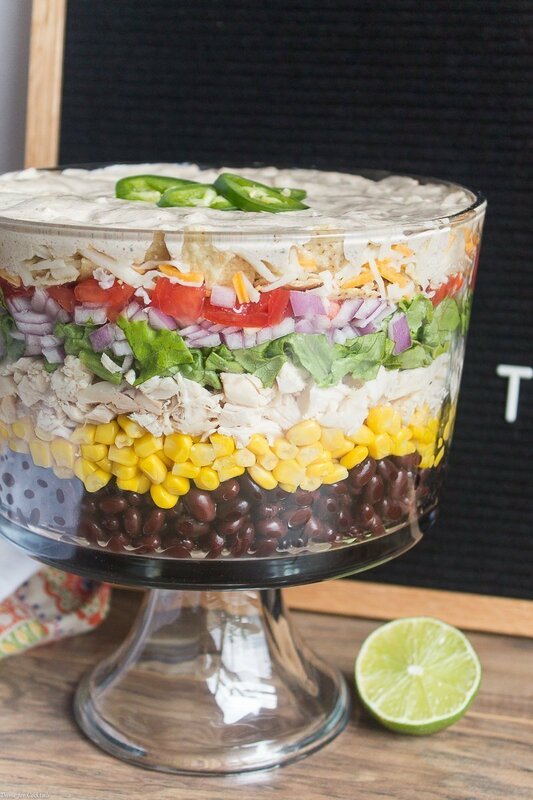 Don’t miss out on last minute summer cookouts when you can whip up this easy-to-make Layered Chicken Taco Salad full of tender chicken and plenty of vegetables. Flavorful herbs make the creamy dressing a perfect compliment to the Tex Mex components in this salad. Hey folks, today let’s talk about convenience cooking. We want summer to be a time to slow down and relax. In reality though there is usually more going on than we can handle! Just recently friends invited me and Paul to an impromptu potluck. Naturally everyone expected me to make a fantastic dish on the fly. This salad idea came to me awhile back and this was the perfect occasion to bust it out. 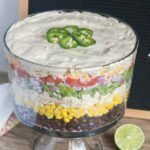 The fantastic aspect of this Layered Chicken Taco Salad is the only thing you have to make is the dressing! Even that is easy peasy because of Dorot flash frozen garlic and cilantro. 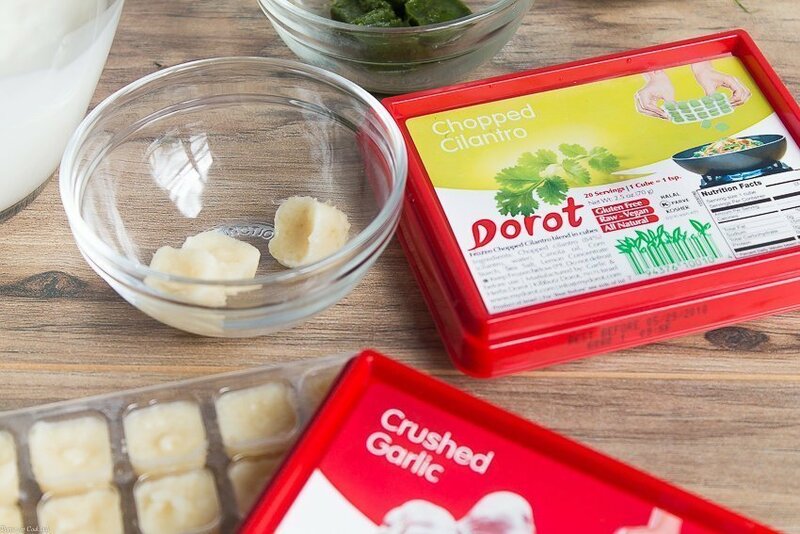 I’ve used Dorot products frequently in the last year when I don’t have immediate access to fresh herbs. Remember my Kale and Mushroom Fried Rice? Dorot ginger totally came to my rescue with that recipe. They have been the answer to my culinary prayers while living in the hotel because it provides an innovative alternative to fresh herbs. 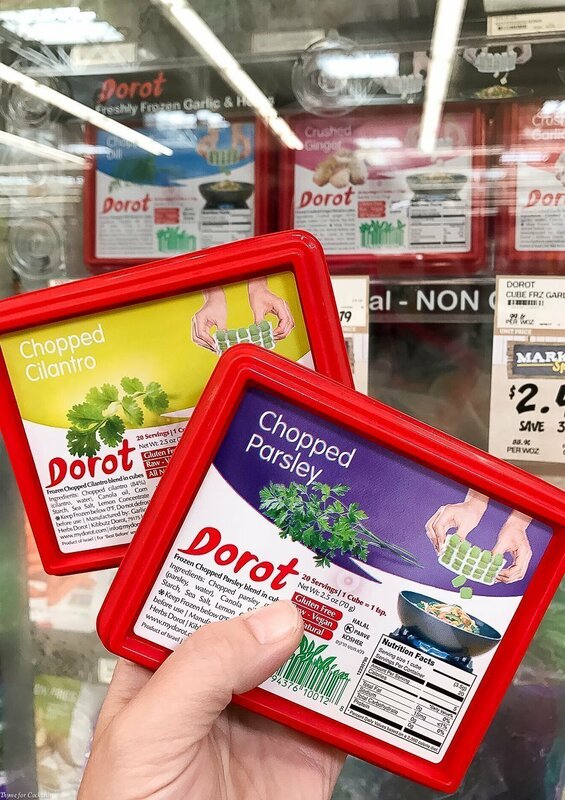 I love that Dorot pulls their products from the fields at peak freshness so they can process and flash freeze the herbs within 90 minutes of harvest. 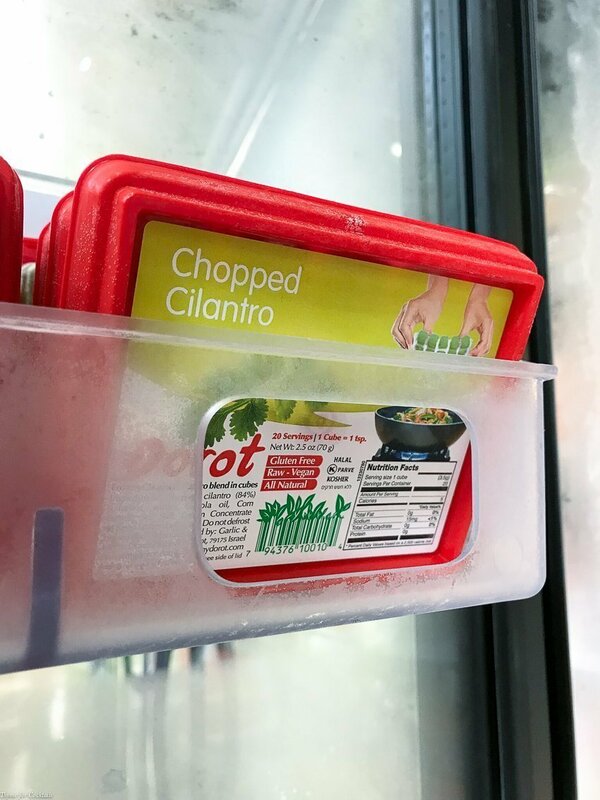 The convenient trays are just the right size for even the smallest small refrigerator! Perfect for a novice cook living in the dorms or barracks. You can find them in the frozen vegetable section of many Whole Foods, Trader Joes, or Fresh Thyme Farmers Market stores. A rotisserie chicken plus a few pantry staples were a must for this recipe since we having a potluck emergency. The veggies were what was on hand in the refrigerator. I added lettuce, tomatoes, and red onions. Diced bell peppers, avocado, radishes, and even cabbage would be delicious too. 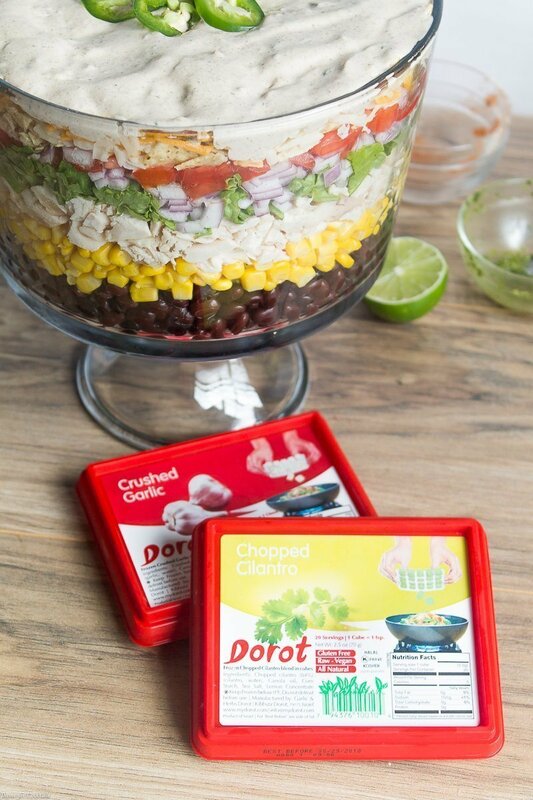 I keep a few cans of organic corn on hand to use in convenience recipes like this Layered Chicken Taco Salad. Top with a layer of creamy dressing made with Dorot garlic and cilantro and you are set. You can make this recipe party style in a large trifle dish, or in mini individuals, also perfect for a large get together. If you want an on-the-go option pack this salad in mason jars, just put the dressing on the bottom, then the chicken, and top with the veggies! 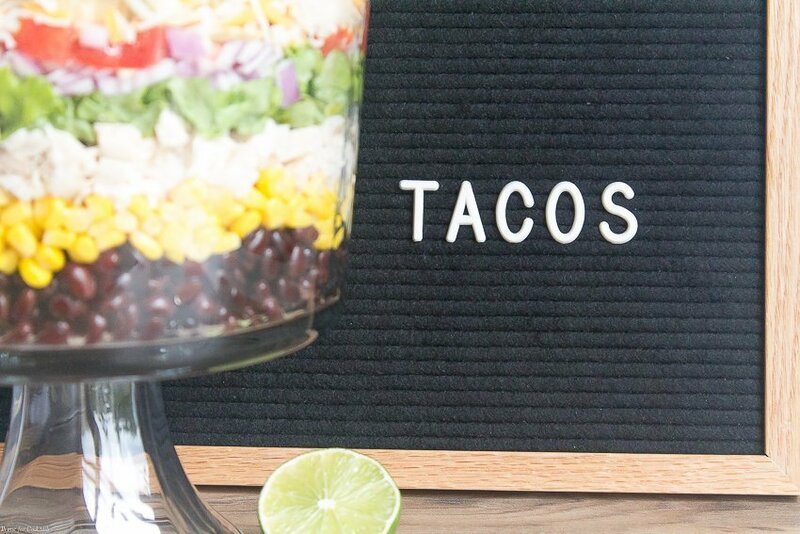 This easy to make Layered Chicken Taco Salad is full of tender chicken, fresh veggies, and a creamy Tex-Mex inspired dressing made with flavorful herbs. 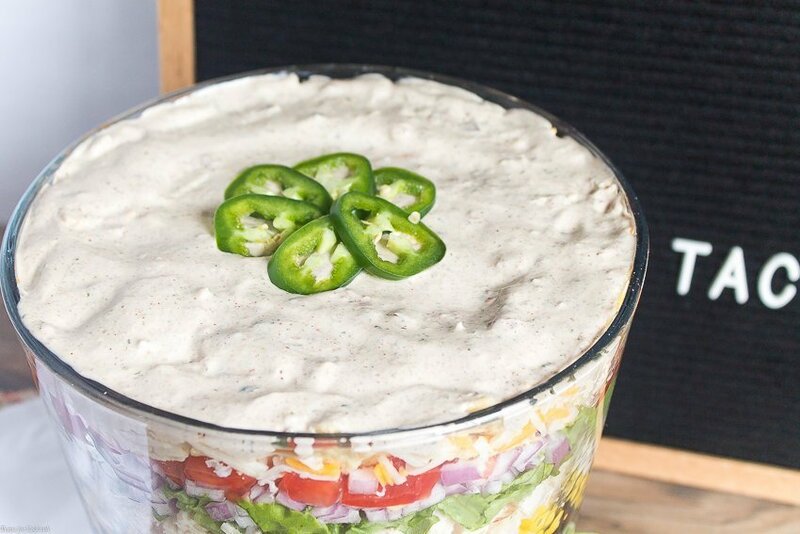 Layer ingredients in order listed in a large trifle dish or smaller individual dishes. Mason jars a great substitute! Salad can be made a day ahead and kept covered in the refrigerator. Top with dressing before serving. This is such eye-candy! It really looks delish. 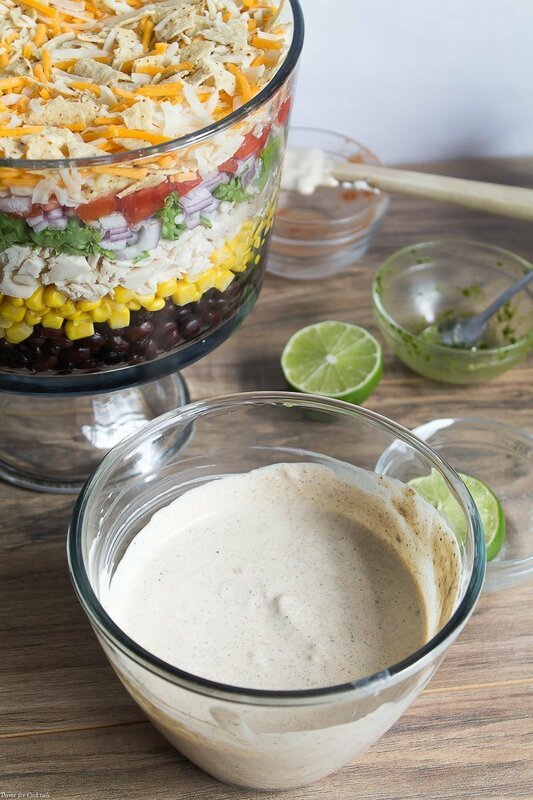 Is there a recipe for the creamy Tex Mex dressing? I tried clicking through and it took me right back to the salad. And I know what you mean about fabulous Dorot- but our Trader Joe’s only carries the Garlic and Basil versions. Now I want to try the Cilantro and Ginger! Especially good for weeknight meals (fast!) in the winter when it’s more challenging to find fresh herbs! I’ve tried growing Cilantro repeatedly, but it bolts SO quickly.